When their car arrived, the sun was already setting into the flat murky pinkness which seemed to stretch forever beyond the balconies and wrought iron railings and shuttered windows of the antebellum mansion. The car had come from even further beyond, traversing the endless wet flatness, that expanse of life hidden from view by the thick black Louisiana swamp, and before that, the hilly empty dustiness of America, and before that, the embracing lights and warmth of Los Angeles, to deliver its cargo here. Here, into this labyrinth of balconies and wrought iron, and into the antebellum mansion itself, with its French doors, which were open to reveal a dining room table that delicately rested on a large open patio. The table was waiting. It had been exquisitely adorned by the servants that afternoon, and now was brimming with Bob’s Cajun-flavored creations in anticipation of the car’s arrival. “Wow,” Chris Hillman whispered to Chris Ethridge, who was staring at the hulking structure which loomed over them with equal amazement. 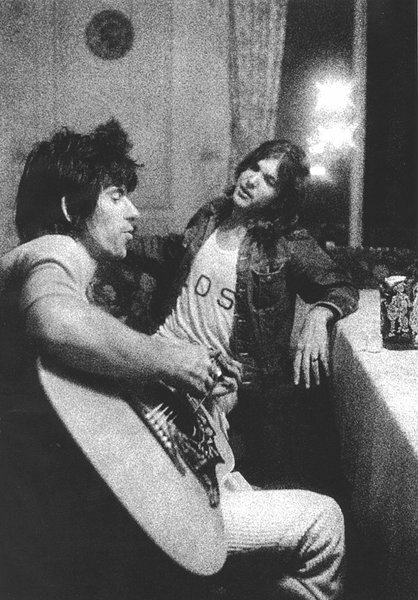 They looked at each other, then looked at Gram Parsons as if to say really?, but Gram didn’t notice them; he was already opening the car door, tossing a rust-colored chiffon scarf that had fallen off during the drive over his neck, and thrusting his long legs out into the humid air. The remaining passengers, “Sneaky” Pete and Phil Kaufman, had also gotten out of the car, and the four band mates and their manager walked together up the grandiose staircase, through the imposing pillars, to the front door, their long hair and tight corduroy pants sharply contrasting the antique mustiness of their surroundings. They didn’t notice that they were being watched, stared at, from one of the balconies. But Gram was unable to finish the thought. A man had swung both double doors open simultaneously with a powerful swoosh that created a burst of air and energy, disrupting the humid dusk, disrupting the carefully-placed rust-colored scarf, disrupting the moment. The man who had opened the doors stood close by her, waiting his turn. “This is the band,” Gram confirmed. With one arm draped over the woman’s shoulder, he gestured dramatically at the group with the other, as though presenting her with grand marble statues. Moving his gesture to the woman he continued the introduction. “And this is Bonnie, my . . . mom. She had me when she was three. Amazing woman.” Smiling, Bonnie rolled her eyes and gave him a jab with her elbow. The man who had opened the doors was Bob Parsons. He shook the hand of each band member, lingering too long, his eyes twinkling, his dinner jacket gleaming. Chris Hillman couldn’t help but notice that Gram had been influenced by this man, that Bob’s charm and style had undoubtedly been contagious to him as a teenager. Phil couldn’t help feeling the desire to wash his hand the minute Bob let go. Sneaky Pete and Chris Ethridge couldn’t help but be distracted by the enticing spicy air which wafted in from the open French doors. Silver forks and knives scraped against china plates. The clean satin table cloth did its best to contain the bowls and beer bottles and condiments placed upon it. Shrimp was plentiful. Cajun air mixed with humidity, smothering them all with intensity of flavor. Bob spoke about his most recent investment ventures. Bonnie spoke about the weather. The band spoke about their tour. About L.A. About their album. Little Avis listened. Droplets of sweat formed on the exposed skin of each band member, who were unaccustomed to the sultry New Orleans air. One by one they removed their custom-made jackets and felt their t-shirts clinging to their bodies, becoming moist and salty in the oppressive environment. Gram joked that Chris Hillman’s hair was beginning to frizz. Little Avis had stopped eating. Actually, she had never started eating. She had just been pushing Bob’s Cajun flavored creations around on the china plate in front of her. “Avis, please eat,” he sounded annoyed. Phil smiled to himself, noting the typical teenage behavior. But, in doing so, he saw that Avis had noticed, and had affixed her eyes directly onto him. He suddenly felt as if she could read his mind, the blue eyes piercing into him, eerily similar to Gram’s, yet different, different. “What time to you have to go tomorrow?” Bob was asking any band member who cared to answer. The band all looked at Phil, whom they trusted to keep track of such things. “But . . . you just got here.” It was the first time Little Avis had spoken during dinner. Her voice was soft, almost a whisper, smooth, and well enunciated. Gram replied to her by raising his eye brows and wrinkling his upper lip into an innocent ‘I-know-but-there’s-nothing-I-can-do-about-it’ shrug. “I’ll take some more shrimp,” Sneaky Pete requested. As if on cue a servant materialized from a side room and fulfilled Pete’s request. She also loaded up the plates of Chris Hillman, Chris Ethridge, and Phil. She brought another glass of ice and whiskey for Gram. Avis put her silver fork down. She had turned away from Phil and was now watching Gram. Gram was also pushing Bob’s creations around on his plate, but would occasionally stab a piece of shrimp or sausage and savor it. He would also occasionally look up from his plate and look away from the table completely, away from the balcony and away from the antebellum structure which girded them, into what had been the murky pinkness upon his arrival, but was now a black void. The swamp and the dusty hills and California and all of it were still out there, but now were hidden behind the black void. “Can I go?” Avis asked him. “Avis . . . “ Bonnie sounded nervous. “No, you can’t.” Gram said it gently, softly. Their identical eyes met, and for a second they were the only two people in the room. The conversation resumed, but Avis continued to watch Gram, silently pleading with him, and getting no response. Frustrated, she picked up her fork and intentionally flicked her rice out from the china plate onto the clean satin table cloth. Then, she slid closer to him and rested her head on his shoulder, her face turned away from the group. “Don’t leave Gram. Don’t leave me here with them,” her smooth voice breaking as she spoke. Chris noticed that Gram did not appear surprised by her actions. Instead, he adjusted his arm so that her head rested more comfortably, stroked her brown hair, which seemed to combine and blend directly with his own, and continued to eat, accepting the feel of salty wetness which began to seep into his shirt. But Gram locked his left arm securely around Little Avis’s back, his hand reaching up to cover her ear. Avis had already thrown both arms around him, her head buried in his neck and shoulder, now audibly sobbing. She clung desperately, resisting all attempts by the attendant to pry her away. “Don’t take her . . . she doesn’t need to go,” Gram pleaded. Chris recalled it was the exact same tone Gram had used to plead with the crowd following their gig at Altamont. Gram shook his head and mouthed the word ‘no’ at the attendant, refusing to give up his hold. Gram stared at Bob in disbelief. “So you drug her? She doesn’t need a doctor! I know what she needs. I know how she feels.” He felt himself flushing. “She was thirteen when mom died. She’s just, hurt. She just needs . . . “ He glanced at his band mates ” . . . friends, she needs inspiration, and—and—something.” Gram spoke into her hair as he cradled her head against his shoulder. He whispered something to Avis which was inaudible to the rest of the table. “I’m her father. I’ll handle her as I need to,” Bob retorted. “You’re not my father,” Avis whispered, but Gram was the only one who heard it. “You’re not her father,” Gram knew he shouldn’t have said it, but couldn’t stop. The stunned frozen state of the house guests was broken only by Phil, who stood up abruptly, and rested a protective hand on Gram’s shoulder. “Hey now,” he began. The reverberation died as suddenly as it had begun, and the loud silence which followed was broken only by a low guttural groan of an alligator in the near distance. As if moving in reverse-slow-motion, Bob retracted his finger, retracted his arm, and steadily lowered himself back into his place at the head of the table. “Okay,” Gram replied calmly, raising his hand parallel to the table, as if to indicate that this was enough, that there was no need to shout, that everything was fine. “I’m sorry Bonnie. I’m very sorry,” he said regretfully, with a politeness that satisfied Bob, atoned the affront to Bonnie, allowed Phil to sit back down, and soothed his frightened band mates, who, one by one, began to breathe again. The frozen silver forks tentatively resumed scraping against china, the shrimp was shakily peeled and deposited into mouths, untasted and unwelcomed. Gram continued to hold Avis, now calm, but limp and lifeless, against him. “It’s delicious,” Gram assured Chris. “And dad made all this just for you!” But Chris noticed that Gram could not make eye contact with him. As the conversation continued, never venturing beyond the topic of the band’s tour or the nearby alligator, Gram patted Little Avis gently on her arm, and loosened his grip. While her head remained on his shoulder, he picked up the silver knife which had been assigned to his place at the dinner table, and buttered a piece of corn bread. Attempting to look at her face, he lifted the corn bread towards her mouth, offering it to her, enticing her to please please eat. When Avis just sighed at the corn bread, Gram touched it against the tip of her nose, leaving a playful smear of butter. Surprised, and unaware that anyone at the table was watching her, she raised her head and smiled at him. Gram smiled too. He continued to tease her, pushing the corn bread against her lips, forcing the ridiculously large buttery chunk into her mouth. She laughed and accepted it, admonishing him with a whispered “stop it, Gram.” He laughed too, but also only as a whisper, and he wiped her face clean with the silk cloth of his serviette. And for another second they were the only two people in the room.